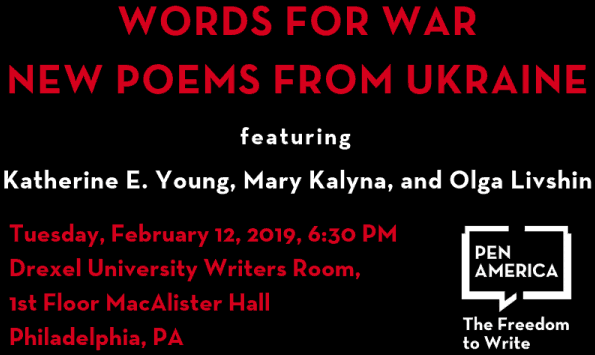 PEN America and the Drexel PEN Society present Words for War: New Poems from Ukraine, featuring translators Katherine E. Young, Mary Kalyna, and Olga Livshin. The evening will be moderated by Harriet Levin Millan, Director of the Certificate Program in Writing and Publishing and Associate Teaching Professor of English at Drexel University. PEN America’s Project Director for Eurasia, Polina Kovaleva, will also offer some remarks. An open discussion about the poems and the ongoing war between Russia and Ukraine will follow. Katherine E. Young’s Day of the Border Guards was a 2014 Miller Williams Arkansas Poetry Prize finalist. Her award-winning translations of Russian authors have been widely published. Young is a 2017 NEA translation fellow and lives in Arlington, VA.
Mary Kalyna’s research has appeared in the Ukrainian Weekly, among others. Her current research documents the experience of Ukrainian forced laborers in Nazi Germany. A life-long activist for women’s rights, human rights, and social justice, she was a key organizer in support of the EuroMaidan in Philadelphia (2013-2014). She lives in Philadelphia. Olga Livshin’s work appears in The Kenyon Review and Poetry International, and has been widely published. Her work has been recognized, among others, by CALYX ’s Lois Cranston Memorial Poetry Prize and the Gabo Translation Prize. She lives in Bryn Mawr.